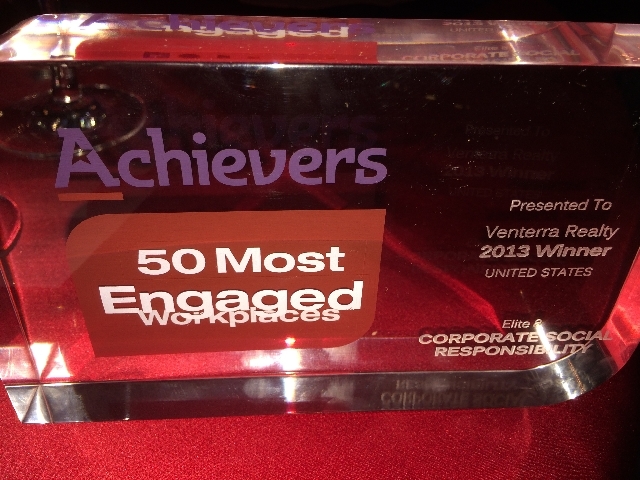 Venterra Realty was honored at the Achievers Awards Gala in San Francisco on Wednesday, April 2, 2014. In addition to being named one of the 50 Most Engaged Workplaces™ In The United States, Venterra Realty was also selected as one of the Elite 8 in the category of Corporate Social Responsibility. The other categories included Leadership, Communication, Culture, Rewards & Recognition, Professional & Personal Growth, Accountability & Performance, and Vision & Values. Bridget Sherrod, Venterra’s Director of Recruiting and Employee Engagement, accepted this elite award on Venterra’s behalf.